Holiday Condo View is located on Pratumnak Soi 6. 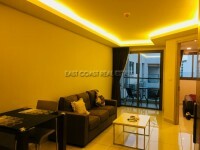 There is easy access down to the beach, as there is in between Jomtien and Pattaya. This Studio is available for sale and rent on top floor (6th), it is 35 sq.m. Fully furnsihed and comes with European kitchen, good size balcony and the building has a communal swimming pool, parking space, 24 hour security. Available Sale in Foreign name with 50/50 on transfer & taxes and Rent for 12 months only with 2 month holding deposit.